SA-G1 Monster Fish sticks are the latest technological breakthrough in fish nutrition for big predatory fish. Predatory fish have very high protein and calcium intake demand especially when they are at the juvenile stage. This is because these carnivorous giants need to grow rapidly when young in order not to be eaten by other predators. Formulated to ensure that all predatory fishes will be able to grow rapidly solely depending on SA-G1 as the only food intake and absorb all the necessary nutrients provided. SA-G1 will also improve the colour development in predatory fish while at the same time ensure sexual maturation when they reach adulthood. SA-G1 Monster Fishes stick is a state-of-the-art scientifically formulated fish feed specially for large predatory fishes. Our proprietary feed attractant increases palatability to ensure optimal consumption of feed. 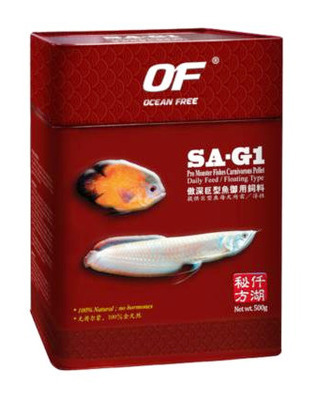 SA-G1 Monster Fishes stick contains a cocktail of nutrients from various sources to ensure that your fish will receive a wholesome meal that ensures rapid growth and development. High content of Spirulina and Krill extracts with other natural colour enhancing elements that will improve the fish's colouration in 1-2 weeks. Bio-formulated with immune-enhancing substances that fortify your fish's immune system for better health and extra resistance against sickness and viral diseases. Contains Ocean Free Opti-SA, a thoroughly tested Carnivorous Metabolic Enhancer that enhances the feed's digestibility and absorbability by at least 30%. Opti-SA also improves the growth of the fins by channelling nutrients to the vertebrate and bones.